Pictured here is the Owen J. Roberts Superintendent Dr. Susan Lloyd, Art Teacher Tom Sonnenberg, 2017 Winning Designer Kaylee Uba and CCIU Assistant Director of Student Services Dr. Anita Riccio. In an effort to bring a higher level of awareness to students of all abilities, CCIU is partnering with Chester County art teachers and students in grades 6-12 for a fun, artistic challenge. Art teachers were invited to engage their students in developing a shoe design that best represents and articulates the awareness, acceptance and celebration of all abilities. Each participating school reviewed submissions and selected one top design to be submitted to CCIU for placement in the 2018 online contest. Submitted designs will be featured on the CCIU website and promoted on social media. The community is encouraged to vote for their favorite design between April 2-6 at www.cciu.org/shoecontest. 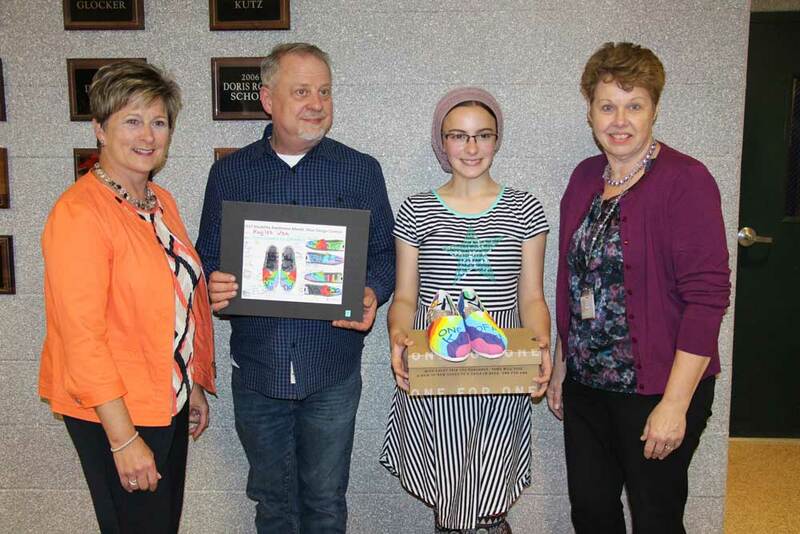 The winning shoe design will be brought to life by Laura Jane Craig, a custom TOMS shoe painter, and the winning student artist will be presented the final shoes to keep with associated press coverage. This is the third year CCIU has been conducting this awareness initiative. The past two year’s contests were met with great success. In addition to the shoe design contest, CCIU is working with the community to enhance awareness and acceptance through several other outlets. Local libraries are showcasing reading lists for adults, young readers and children, as well as hosting free, interactive workshops. individuals with autism spectrum disorder, intellectual disabilities, attention deficit disorders and other neurodevelopmental disorders face within group settings, as well as best practices and preventative strategies to support youth within their programs. The presenters will discuss inclusive practices, engineering environments, working with families and accessible resources. CCIU is hosting its annual lobby event on March 26 in which students with all abilities will greet and answer any questions visitors have as they enter the building on Boot Road in Downingtown. The County Cup will provide free coffee and light grab-and-go refreshments to visitors, and students from the Child and Career Development Center will prepare cookies for the event. An employer recognition breakfast is also being held in the month of May. The CCIU Discover program has developed community partnerships with over 200 local businesses who open their doors each week to students throughout Chester County, supported by job coaches, to explore vocational interests and learn work readiness skills for future employment. CCIU offers a multitude of programs for individuals with all types of abilities from preschool through adulthood. To find more information on programs offered or events highlighted above, please visit www.cciu.org/abilityaware.